Newest partnership promises further global expansion for the London based company. The Conversion Group’s (TCG) newest partnership with the Sugar Land Wine and Food Affair, based in Sugar Land, Texas and part of the Greater Houston metropolitan area, reinforces the group’s position within the food and beverage market in North America. The joint venture will be a true collaboration between The Conversion Group and the Fort Bend Chamber of Commerce whose CEO and founder of the festival, Keri Schmidt, will remain on the event board. Following the blueprint of the group’s already established events, the Sugar Land Wine and Food Affair is an event for a wide demographic, from top chefs and foodies to wine connoisseurs and enthusiasts, to come together and immerse themselves in a world of gastronomy and mixology. The festival is made up of various events, beginning with an elegant VIP Kick-off Dinner, all the way to a vibrant On the Rocks Bartenders Challenge, wine and spirit seminars, grand tastings and in international bistro brunch over a five day period. 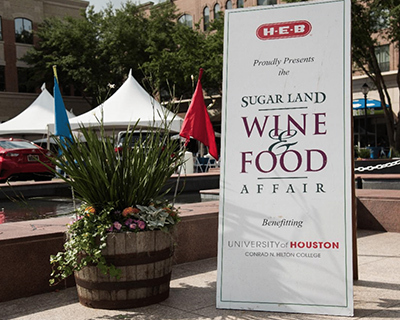 CEO of TCG, Allen Gibbons comments: “The Sugar Land Wine and Food Affair is the next step in the group’s aim to build a network of food and wine festivals across the USA, each one unique and demonstrating the quality and diversity that’s out there. We are building a network of events where the founders are still involved and engaged, whilst taking advantage of the true scale that the group can offer in key areas. I look forward to working with Keri and taking the Sugar Land Wine and Food Affair to even greater heights. “The Conversion Group could not be a better partner for us”, says Keri. “As a global events company who run some of the world’s most prestigious events, they have a professional team with a great depth of experience in all aspects of event planning. Having this global influence and knowledge on board for the festival will be a great asset to echoing what we do, further than Sugar Land and beyond the USA. We want to have an international reach and firmly believe The Conversion Group is the way forward”.